A perfect vegan coconut whipped cream to use with your vegan desserts, made with three ingredients: coconut cream, icing sugar and vanilla. Here in Greece, we are going through the Lent period. The Great Lent period starts with Kathara Deftera and ends 40 days later. During this period as well as the week before Easter, most of the Orthodox Christians fast. Some people fast the whole period and some just fast part of this period. During Lent, they abstain from eating meat and animal products. This year, my daughter’s name her and her birthday, as well as my birthday were during the Lent period, so I have prepared some vegan cakes, which will be posted soon. My next post will be the Carrot and Banana Birthday Cake I prepared for my daughter, on which I used this vegan whipped cream. Coconut whipped cream is a good substitute for Chantilly or Whipped cream. It can be made with coconut cream or coconut milk, which is vegan and lactose free. 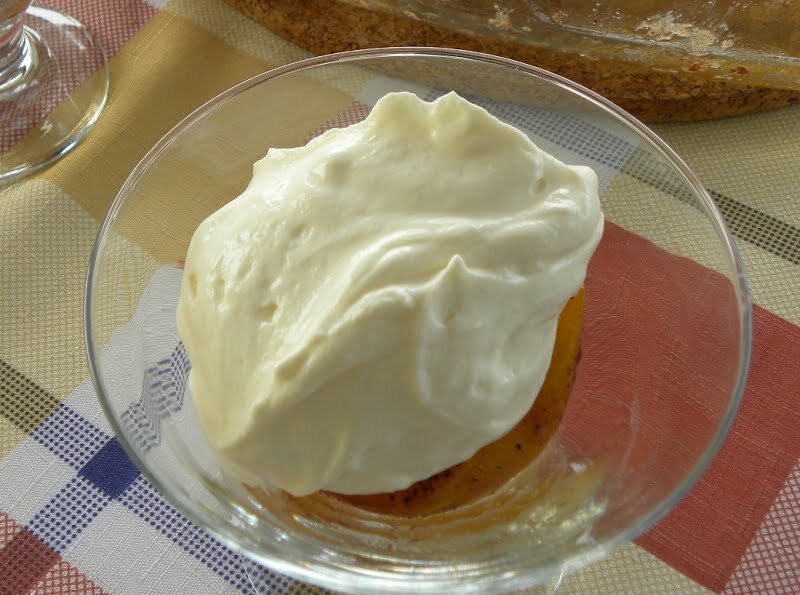 It is very easy to make this whipped cream. It’s like making normal whipped cream by using full fat cream whereas here you need full fat coconut cream. If you use low fat coconut cream, it will not set. However, before whipping it, you have to put the cream in the fridge for some hours, or preferably overnight for the cream to solidify. When you open the can, make sure not to shake it as the cream gathers on top and the coconut water stays at the bottom. You do not need a metallic bowl or to put the bowl and beaters in the fridge in order to beat the cream, as I have seen this mentioned in other instructions. Carefully scoop the cream out into a bowl and use a hand mixer to whip it. If the cream it too hard to beat, you can thin it out with a tablespoon of leftover water from the can, use liquid vanilla or use blossom or rose water, as I did or even honey. If you like the scent of citrus blossom water or rose water like I do, this will add additional taste to your coconut cream. It is preferable to use icing sugar to sweeten the cream but again if your cream is too hard, you can sweeten it by adding honey gradually and mix until it becomes smooth and creamy. Put the coconut cream in the fridge overnight to harden. Open the can carefully without shaking it. When refrigerating, the cream stays on top of the can and the water will stay below. Use a spoon and collect all the cream which is on top. Put the remaining in a strainer and collect the remaining cream. (Do not discard the coconut water left. It can be used in desserts or savory recipes instead of water or in smoothies). Beat the cream with powdered sugar and vanilla until it is thick. If the cream is too hard, add a tablespoon of coconut water or citrus blossom water and then mix. Store the cream in the refrigerator up to 1 - 2 weeks. Serve with your desserts or decorate cakes. Leftover coconut water can be used in savoury recipes, such as stir fries, curries, soups etc., instead of water, in smoothies to make ice cubes etc.